Babatunde at a May Day march. It’s not easy to bring soulfulness into the world. Many try, and if you have a positive view of human nature, you might say it is what everybody tries to do. Babatunde Folayemi did it. Aside from having served on the Santa Barbara City Council, Babatunde is most widely known for his social justice advocacy on behalf of disaffected and gang-involved youth. During his time in Santa Barbara he launched and participated in various programs to help “the kids,” as he called them, or “our children,” do well in school, get jobs, stay out of jail, take good care of their families, become entrepreneurs, pursue their dreams – and be activists for their own communities. One of these projects offered free removal of tattoos that were “anti-social” (e.g. gang tattoos) or “visible,” such that they might interfere with getting a job. Yet it was while sitting on the board of that organization that he himself decided to get his first tattoo, a large one, on his forearm. He drew it himself, after one of his paintings, of a black Christ, with dreadlocks. Going along to get along was never his way. Though he almost always presented as calm and very cool, Babatunde was a romantic idealist of the first water, with a particular heart for outcasts and fighters. Trying to determine why that was is like trying to answer any other fundamental mystery of the human heart. In Babatunde’s view, the children of the working-class, immigrant poor in Santa Barbara – of Santa Barbara’s servant class, if you will – are neglected and even victimized by the powers that be. This made him angry. I remember the first time I heard him say, in reference to some injustice, “That’s the way things work on this plantation.” He said it with one of his trademark laughs, one where he shook his head at the same time. Babatunde Folayemi was born Anthony Northern, in 1940, in Harlem, one of six children (five of them boys) of Sarah Freedman Northern and Chauncey Scott Northern. Chauncey Northern was an opera singer who lived and worked in Europe before returning to the United States, where he established the Northern Vocal Arts School at Carnegie Hall, and worked as the minister of music for a church. When Babatunde was a child the family was involved in leftist politics and the cultural life of the Harlem Renaissance; Paul Robeson and Langston Hughes were dinner guests. Babatunde described himself as having been a “brawler” as a teenager, feeling the need to fight for himself and his siblings as they walked home from school across the city, getting involved in gang skirmishes. Maybe that’s the key: He wanted to help kids having the same trouble he’d had. His wife, Akivah Northern, has a slightly different take on the same idea. Babatunde’s father would go to businesses along the kids’ route home, setting up tabs and asking shopkeepers to keep an eye out for his children, and shelter them if they were in trouble. In helping troubled youth, Babatunde was trying to share the advantages he’d had. After high school, Babatunde joined the Army and served in the Air Patrol during the Vietnam War; then left the Army and in 1963 became a close associate of Malcolm X, until his assassination in 1965. “Malcolm encouraged him to use his art as a political tool,” Akivah said. Babatunde produced murals, and he opened the Harlem Art Gallery in Harlem in the 1960s. He met Akivah in 1967. 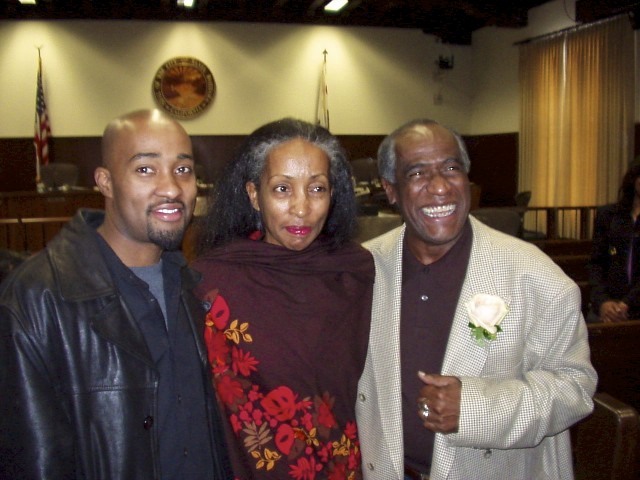 Babatunde Folayemi (right) at his swearing-in as a Santa Barbara City Council member, in 2002, with Akivah and their son, Cinque, now a filmmaker in New York. In 1972, when their son, Cinque, was two years old, the Northerns went to Tanzania, where Babatunde worked in the Ministry of Culture. He did propaganda not only for projects that the very idealistic young nation of Tanzania was undertaking but for numerous independence movements operating from Tanzania. “All of those movements became national governments,” said Akivah. “Some you’re proud of and some you’re not proud of, but he was doing propaganda for all of them.” Akivah has a photograph of Babatunde with Julius Nyerere, Tanzania’s first president. (Nyerere was “a wonderful, gentle spirit” according to Akivah, who notes that Tanzania won independence from Great Britain without waging violent revolution.) They are in the national art museum during a celebration where, for the first time, she said “there are barefooted people in attendance.” It was Babatunde who persuaded Nyerere that not just the elite should come to the museum, but the poor and the traditional tribal people. It was while he was in Africa that Tony Northern took the name Babatunde Folayemi. Babatunde translates from the Yoruba language as “the father returns,” meaning that the child resembles his grandfather. According to their friend Michael Marzolla, a painting of Babatunde’s still graced the Dar es Salaam airport when he passed through there a few years ago. It is of “Africans doing progressive things,” Marzolla said. In 1977, the family moved back to the United States, first to the East Coast, then to the San Francisco Bay Area, where Babatunde worked in the Tenderloin with mentally challenged people. They then went to Los Angeles, where he got a job first working with seniors, then designing skateboards and clothing for Powell-Peralta; then opening “Bronze Age,” his own skateboard shop, in Venice, later selling it. He spent his spare time brokering a truce between the Crips and the Bloods. It was Akivah who, in 1987, initiated the move to Santa Barbara, where the beach reminded her of the beach on the Indian Ocean in Dar es Salaam. 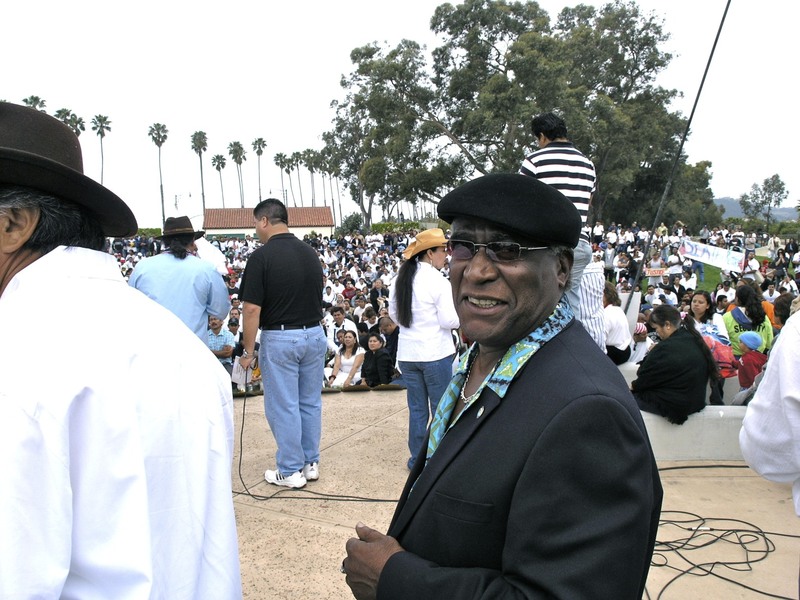 Babatunde worked briefly for the Alliance for Community Development, and then for about a decade as Coordinator of Youth Services for the City of Santa Barbara’s Housing Authority. During that time he also headed up the Pro-Youth Coalition. With Marzolla, a 4H club director, he started a community gardening project whereby seniors taught gardening to teens, and the teens in turn helped the seniors with computer skills. He was instrumental in establishing United Youth Empowered, which has since become a standing city advisory committee, the Santa Barbara Youth Council, which made sure that at least one of Babatunde’s campaigns, for a place downtown where kids can hang out, came to fruition – in the form of the Twelve35 Teen Center on Chapala Street. Margie Trejo, the Housing Authority’s director of resident services, said Babatunde’s title “could’ve just been ‘Babtunde. '” He helped people with whatever they needed: talking and listening for hours; praying with people, which was against the rules; helping people get jobs, helping with their budgets, helping with paperwork, bringing in tutors. Mary Jo Terrill, now the night nursing supervisor at Goleta Valley Cottage Hospital, was running St. Vincent’s home for drug-affected newborns when she met Babatunde in the 1990s, because he began approaching her about moms who needed safe houses; kids who needed foster care. He picked kids up from juvy or drove them to jail because they were turning themselves in. He spent a lot of time in court trying to get kids reduced sentences and alternatives to jail time. He’d been doing basically the same thing ever since he left the Housing Authority. Just a few months ago, he received an award from the parole and probation officers association, on the recommendation of Judge Frank Ochoa, who said Babatunde’s advice was enormously helpful in his sentencing decisions. One of his favorite nonprofit projects recently, which he supported and tried to get kids involved in, was Everybody Dance Now, a program combining dance instruction and mentoring. He was also agitating vehemently against the gang injunction. He did not believe in isolating young people from one another. “He was about bringing them together,” said Michael Valdez, who first met Babatunde a couple of decades ago, one of the many young people with whom Babatunde remained close. A Harley mechanic whose wife’s family owns the Judge for Yourself Café, Valdez is working on opening his own shop, where he intends to teach kids his skills. “I was taught by Baba to pass it along,” he said. Babatunde served as a city councilmember from 2002 to 2004, a term that was probably not as stellar as people expected, and probably would have been more so if he not been stricken with intestinal cancer. It might have been that, or it might have had something to do with his position on abortion, which he was openly, though not aggressively, against – while relying on the support of a strongly pro-choice progressive community. As one political friend said, “Any campaign manager can tell you that if you are running for City Council in Santa Barbara, you are pro-choice. Period.” It was no doubt a combination of factors, but in any case, he was not re-elected. 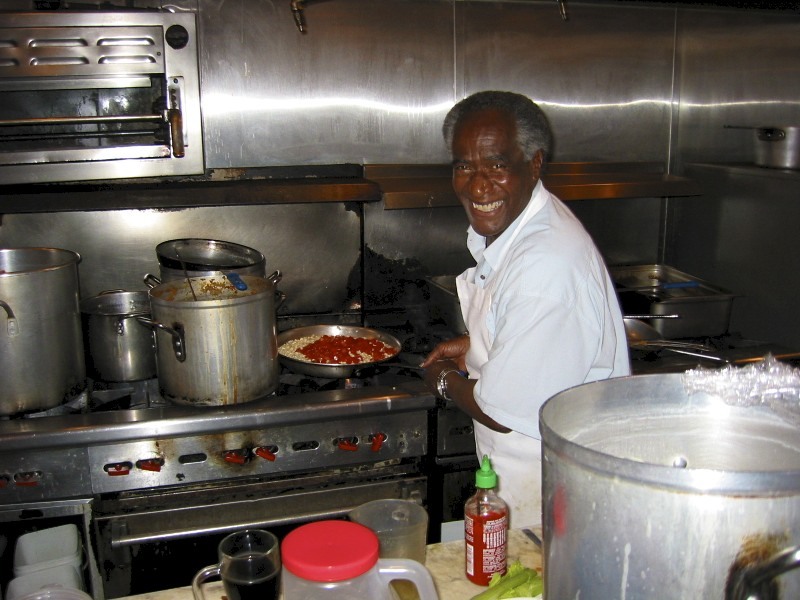 Babatunde as chef, hosting his election night party in 2001 at Pascucci's. “Love yourselves,” Babatunde told a crowd of thousands gathered at the Sunken Gardens for the immigration-reform demonstration dubbed A Day without a Mexican. “Don’t let anybody make you feel like you don’t deserve the best, don’t let anybody make you feel bad about yourself. You are children of God.” It was not the kind of language you expected to hear at a political demonstration. But his speech that day, as on other such occasions, a characteristic mix of rabble-rousing and peacemaking, delivered without notes, brought the house down. What the many Santa Barbarans who dealt with him on a personal basis know is that this kind of feeling was not just for the cameras. Behind the scenes, he walked his talk. Behind the scenes, he was there for people. Those of us who lucky enough to have basked in his warmth will always be strengthened by it. Speaking for myself, I know that Babatunde would want us to continue his legacy of speaking truth to power and embracing community. Pass it on. Besides his son, Cinque Northern; and his wife, Akivah Northern; Babatunde Folayemi is survived by two brothers, Glenn and Henry Northern, of New York, and by numerous nieces and nephews. A service will be held at at First United Methodist Church, 305 E. Anapamu Street, on Saturday, April 14. There will be a public viewing of the body from 9:30 a.m. to 12:30, and a worship service from 1-3 p.m., followed by repast in the fellowship hall. The next day at 2 p.m., his body will be hand-lowered into the ground, in a green burial at Joshua Tree Memorial Park. In leiu of flowers please consider a donation to one or each of the following three organizations: The Liberty Program, care of the St. Francis Foundation, 2323 De La Vina St., Santa Barbara, 93105, or Primo Boxing, 701 E. Haley St., 93101, or the soon-to-open Ben Carson Schoool of Medicine at Babcock University in Nigeria (contact family). Another celebration, with a showing of Folayemi’s artwork from the 1960s to the present, is tentatively planned for June 10, at a time and location to be announced.